Basically four lunar eclipse will occur consecutively and all appear on Jewish Holy days! This is a rare occurance for four lunar cycles to happen on successive Passover and The Feasts of Tabernacles (Sukkot)observances. However it happened twice before in the 20th century. The first set occured in 1949 – 1950 the year after Israel became a state! The second set happened in 1967 – 1968, the year Israel liberated Jerusalem! Before these dates it happened in 1493, the year after Columbus sailed the ocean blue and Spain expelled all Jews. What was God telling the beleagured Jews? That He was fully aware of their circumstances! What was God telling the Jews in 1949 and 1967? 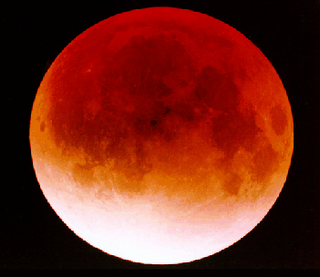 Looking at the next 7 years, we wonder what is God telling Israel through the upcoming lunar eclipses? These dates are significant and are special days in the Jewish calandar. Nisan 1 is the first anniversay of the Exodus. Nisan 1 also marks the beginning of the religious festival cycle. “And a fourth angel sounded, and the third part of the sun was smitten,…(Rev. 8:12) The idea that a third of the sun is smitten may be a reference to a patial eclipse. The first day of Av is in the middle of the time period when the Jewish people mourn the destruction of the Temple of God. Historically Moses descended from Mt. Sinai with the two tablets of the Ten Commandments, and found the people engaged in gross idolatry at the foot of the mountain. That was on Tammuz 17. Also, on Av 9, the Hebrew spies returned from spying out the land of Canaan and brought an evil report and the people lost faith in God, and were condemned to wander 40 years in the wilderness (Numbers 14:34). Av 9 also commemorates the date of the destruction of the first Temple by Nebuchadnezzar of Babylon in 586 B.C., and the second Temple by the Roman general Titus on the same date in 70 A.D. These two dates are days of infamy in Israel. The three week period between Tammuz 17 and Av 9 are called between the straits and are days of mourning, repentance, and lamentations. How interesting that a solar eclipse will fall on the date of Av 1, in the middle of mourning and lamentation, three years in a row! Why did God create the stars in the heavens in the first place? We read one significant answer in Genesis, the first chapter. Moses wrote: And God said, Let there be lights in the expanse of the sky to separate the day from the night, and let them serve as SIGNS to mark seasons and days and years (Genesis 1:14, NIV). The word for sign here, in the Hebrew, is owth, and means a signal, as a flag, beacon, monument, omen, prodigy, evidence, etc. The word for seasons is the Hebrew moadim and means festivals, literally, appointed times. Gesenius’ Hebrew-Chaldee Lexicon points out that this word means a sign, a token (Exo.12:13; Josh.2:12), signs and times (Gen.1:14), i.e., signs of times. It is used of a military ensign, a sign of something past, and a sign of something future, a portent, as well as a sign of anything which cannot be seen. For seasons , Strong s Concordance has an appointment, i.e. a fixed time or season; spec. a festival. Gesenius has it, (1) a set time, . . . (2) an assembly . . . (3) a place in which an assembly is held . . . (4) an appointed time, a signal. 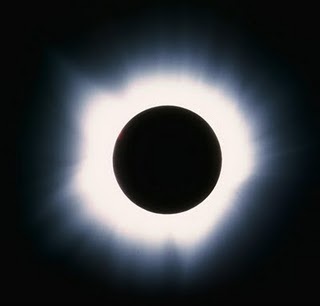 Thus heavenly bodies, and the periodic return of comets, and celestial meteor showers, and eclipses, can be, in Biblical terms, a heavenly sign ! Yeshua spoke of such signs occurring before His return to planet Earth. When such a sign occurs on a moad or moadim, or Festival of God, it is especially significant. Jesus Christ Himself said, referring to the days before His second coming: And there will be fearful sights and GREAT SIGNS from heaven (Luke 21:11, KJV). Christ went on, And there will be SIGNS in the sun, in the moon, and in the stars . . . (Luke 21: 25). 1 October was the beginning of a year-week in Israel’s lunar calendar, a period of seven years, of which the seventh year is a sabbatical year. It is generally known that the Antichrist will conclude a covenant with Israel and the nations for one year-week (Dan. 9:27). There was great expectation that his appearance would be at the beginning of this year-week. And the Antichrist can only be revealed after his withholder, the true church, has been taken out of the way (2 Thess. 2:6-8). The year-week which started on 1 October on the Jewish calendar is the last full year-week within the framework of the last generation of 70 years since the restoration of Israel in 1948 (May 1948 to May 2018). A Messianic Jewish preacher in the US, Mark Biltz, made the discovery that during the present year-week (Oct. 2008 to Sept. 2015) there will be various solar and lunar eclipses (blood moons), which are regarded as prophetically significant in light of Joel 2:31. Revelation 6:12 confirms that similar phenomena will often occur during the coming great tribulation. The beginning of the next year-week in Sept. 2015 will introduce the 50th prophetic year, therefore a Jubilee Year, since the recapturing of Jerusalem on 7 June 1967. If 49 prophetic years of 360 days each (17640 days) are calculated from 7th June 1967, the period will expire on 23 September 2015 on the Gregorian calendar. That date will coincide with the Day of Atonement (Yom Kippur) of that year, which is also the day, close to the beginning of a year-week, when a Jubilee Year may start (see Lev. 25:8-10). By then, Israel will be reconciled with their Messiah and enter His promised reign of peace. If this expectation is fulfilled, the year-week between 2008 and 2015 must be the tribulation, or “time of Jacob’s trouble” (cf. Jer. 30:7). It is obvious that there were strong prophetic indications, as well as compelling circumstantial evidence, to expect a divine intervention at the beginning of October, as well as the revelation of the Antichrist shortly afterwards. There is nothing wrong with such a pronounced expectation since we should always be expecting the Lord (Matt. 25:13; Heb. 9:28). However, it is wrong to indulge in rigid date-setting - that is why we consistently warned against this practice. It is questionable whether people who had no expectation on the second coming during this important time are waiting dedicatedly on the coming of the Lord Jesus at all. When will they awake to the fact that we are right at the end of the church dispensation? We still have every reason to believe that the coming of the Lord is near, and will continue proclaiming it in light of every fact to our knowledge until He comes. It may, for instance, be possible that the year-week of the Antichrist’s rule does not precisely coincide with Israel’s cycle of year-weeks. In light of Matthew 24:22 it is even possible that the year-week of the Antichrist’s reign might be shortened. Whatever the case may be the fact remains that we are in a terminal phase of the church dispensation. The Lord Jesus says, “Now when these things begin to happen, look up and lift up your heads, because your redemption draws near” (Luke 21:28). Do not stop interpreting world events in the light of Christ’s coming. The ten virgins of Matthew 25:1-13 made the mistake of falling asleep in the midnight hour when the Bridegroom delayed His coming. Do not make the same mistake, but rather “watch and pray always that you may be counted worthy to escape all these things that will come to pass, and to stand before the Son of Man” (Luke 21:36). If we cannot see that the world is heading for unprecedented tribulation there would be very little reason to want to escape it by way of the rapture. Maranatha!